"Happy Thanksgetting." "Happy Holidays." "Black Friday." Santa Claus. Easter Bunny. Turkey Day. As many readers may already know, the word "holiday" actually means "holy day." Holy is a powerful word. It is used to describe the character of God. "Be holy as I am holy" (I Peter 1:16). Essentially, the word holy means "set apart" or "pure". A holiday, therefore, is a day set apart from work and other typical events. In the late 16th century in England, the Puritans sought to establish their reformation of the Roman Catholic Church as the state Church of England. There were some, however, who did not agree with the beliefs mandated by the State, so a group of Separtists (who would be later known as the Pilgrims) disconnected from the Church of England and sought religious freedom elsewhere. Understandably, persecution followed the Separtists wherever they went. Because there was no place for the Separtists to escape in order to practice religious freedom, they boarded the Mayflower in September 1620 in search of greener pastures. Faced with economic difficulty in Holland, the Separtists turned their sails for a new world. In November the Mayflower landed in Plymouth, Massachusetts. But their struggles had only just begun. With the assistance of the Native Americans, and most famously Squanto, the Pilgrims survived the winter. 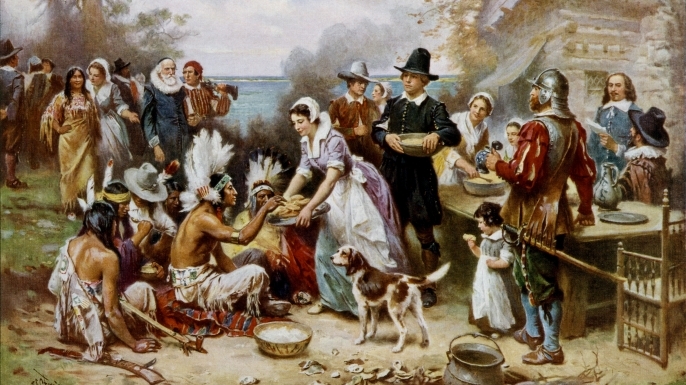 In 1621, marking the one year anniversary of the Pilgrims landing at Plymouth, the First Thanksgiving was celebrated after the harvest with ninety Native Americans and fifty-three Pilgrims (History.com). Yet this story, like so many others, has been hijacked by our societal obsession with ourselves and our material possessions. "Happy Thanksgiving" has now been replaced with "Happy Thanksgetting", which refers to all of the great "deals" a shopper can get when they shop for Christmas presents around Thanksgiving. The thought frustrates me. Let us remember the Lord this Thanksgiving. "Come and hear, all you who fear God; let me tell you what He has done for me!" (Psalm 66:16). This Thanksgiving, oh Church, oh Bride of Christ, what will you celebrate? "Give thanks to the Lord, for He is good. His love endures forever!" (Psalm 107:1).